While we will never know the entire story of Brandi’s life, we do know that she was found living in horrible conditions. Having lost her sister, she clung to life while she kept watch over her sister’s body. She must have been so scared and confused. On August 18, 2006, an angel was smiling on Brandi because that was the day she was brought to Kathy as she joined the MaPaw family. Kathy was told it could be only weeks or months that Brandi would be with her. This frail senior had already proven that she was a fighter, but she needed someone to love her the way she so greatly deserved. Kathy was determined to give her all of the love and attention she had missed out on for the past 16 years. Almost every day Brandi went to work with Kathy where she had a special bed and got lots of attention from all of the office visitors. At lunchtime, Kathy stopped what she was doing to take Brandi for her favorite ~ a cheeseburger from Wendy’s. 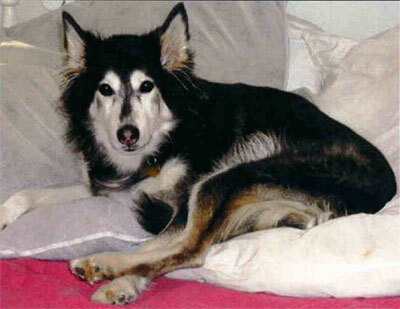 Without even knowing it, Brandi became the perfect example of why we at MaPaw do what we do. Not only that ~ she proved that a lot of TLC from someone who genuinely cares can go a long, long way. Against all odds, she saw her 18th birthday. It is with a very heavy heart, that we at MaPaw say goodbye to a dear member of our family. Our hearts are breaking and we are filled with grief as we mourn Brandi’s passing. Godspeed, darling Brandi. You are free of the pain that held you back. You can once again lie by your sister’s side. Many are waiting to greet you North of the Rainbow Bridge. You are deeply missed and will forever be in our hearts. Brandi brought out the best in everyone ~ so many people loved her and wanted to help her. We were so lucky to be the ones to share our life with her. Thank you to everyone that cared for this special girl. Run and play, free of pain, sweet Brandi. We miss you and you will always be in our hearts.